One of the points I find while doing this challenge is trying to come up with some interesting answers to the questions. I remember years ago seeing Mazes and Monsters the film loosely based upon the disappearance of James Dallas Egbert III. So while it is an appearance in the media the game system is entirely fictitious. 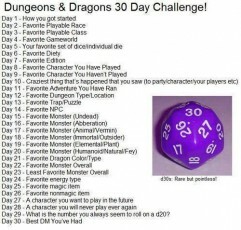 My answer to this question would have to be the Advanced Dungeons and Dragons cartoon, I remember watching this when I got home and being enthralled by it. Recently I’ve been on holiday and one of my friends expressed a desire to play D&D; this was something he had never done but always wanted to try, so I agreed to run it for him. I thought this would also be a good opportunity to try out the new D&D Starter set that had been released by Wizards of the Coast, partly because I was curious to see what the new version was like and I wanted to see how it introduced new players to the hobby. In all my years of being a GM, I’d never had to break in a group, all the people I had gamed with had prior experience. In anticipation of getting the game going, I sent links to the new rules on the Wizards website a couple of weeks beforehand and I also ordered the new starter set. Upon unboxing the set I was struck by the contents; which was one rulebook, one adventure, pre-generated characters and a set of dice. This reminded me of the red box D&D set I had got for Christmas one year; the included dice were pre-inked, unlike the red box dice which had I coloured in with a white crayon. I glanced at the rules and dove into the adventure; Lost Mine of Phandelver, which is a massive improvement on the old B2 Keep on the Borderlands adventure. I also thought the pre-generated characters where nicely done and the backgrounds tied them to the adventure. Reading the rules booklet gave me a flavour of the new 5th edition rules and I certainly liked what I saw. There have been fundamental changes to the system; the concepts of advantage and disadvantage are not new ones but I think they are a major improvement over what has gone before. I also appreciated the changes made to the magic using classes, you prepare your spells and then you use spell slots to cast them. This really does give you a lot of flexibility as spells become more potent if you use higher powered spell slots to cast lower level spells, although doing it this way means that spells no longer increase with power as the caster does. A first level Magic Missile will always give the same number of magical bolts if cast with a first level spell slot. The designers used some of the 4E elements here, where you can take a short rest or long rest; long rests get you all healed up and takes some of the burden of not having someone who can heal the party. Trying to get an existing gaming group on-board using pre-generated characters can be a time consuming process, a new gaming group is far more likely to welcome the chance to play something already done since it takes all the work out of the character creation game. The five provided are good examples of the archetypes which first appeared in D&D 3, when the iconic characters first appeared. Each character also has a reason for being there and an interesting background as well. With characters selected, a brief explanation of what the players needed to know to get started, I kicked off by asking each of them to explain why they were working for the patron. After five hours or so of play we packed up and I put all the characters into the box for another day. If I didn’t have so much Pathfinder materiel I may be tempted to go down the 5th edition route and use some of the older material I have with the rules. The official page of D&D5 complete with links to the downloadable rulebooks. A very useful collection of resources for the game. I seem to have a thing for decks of cards and this Kickstarter is another one in the series of concept cards. I’ve backed all their other projects which have paid off in spades, so I’m confident they will come through with this one. Kickstarter – The Folio #3, 1E/5E format, Adventure Module! After the success of The Folio #1&2 number 3 has up for funding. With the pdf edition for $5 you really can’t go wrong with backing a module in both 1E and 5E versions.